March, 20, 2015 did not look or feel like the First Day of Spring. Can you believe we had snow? Not an awful lot, about 3 inches. But spring will arrive, the sun will shine, all the snow will disappear, the grounds will thaw and I will be planting in my garden with harvest to follow in the not too distant future. 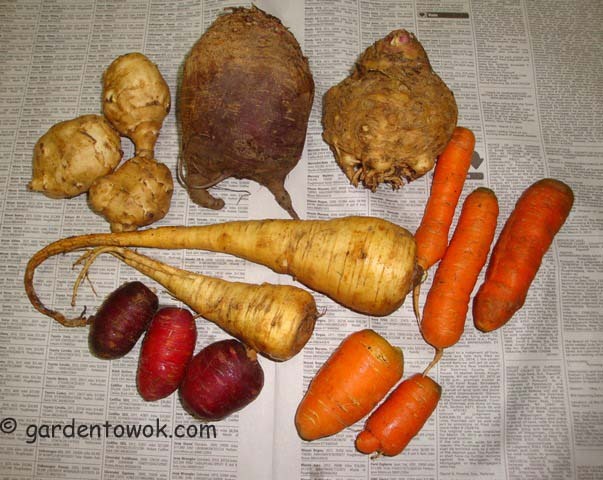 Below photo shows the last of my overwintered root crop that were stored in foam ice chests in my unheated garage. I forgot to take photos of how I stored the root crop in the foam ice chests so you will just have to use your imagination, so sorry. ∞ Covered ice chest with lid (slightly askew) and placed along outside wall of the garage. ∞ Used throughout the winter as needed. Peeled the sunchoke (Jerusalem Artichoke), celeriac, parsnips and carrots. Cut into bite-sized chunks. Placed on sheet pan with a few crushed garlic cloves (from indoor storage), few sprigs of thyme (from garden). Tossed with olive oil, S&P. Roast in 400º preheated oven until tender, about 40 minutes. Served as a side. Cut the beet in half lengthwise. Tossed with a bit of olive oil and salt. Wrapped in foil and placed in oven same time as the other root crops. When cooled, peeled and cut into small cubes, tossed with unseasoned rice vinegar, bit of sugar, salt, minced ginger and lemon zest. You may remember the thyme photo below from my February 9 post. 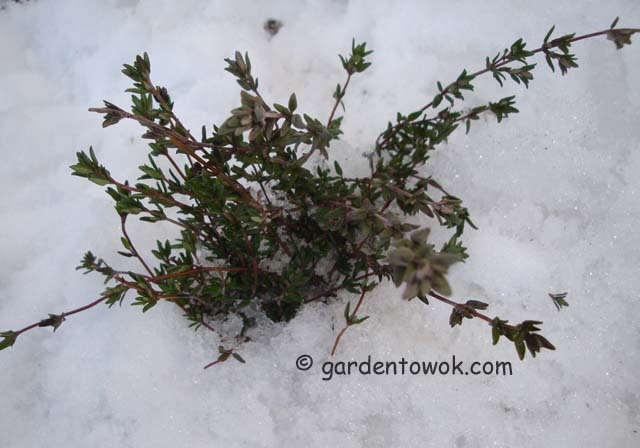 The thyme in the photo below is the same thyme plant as the one in the photo above when a lot of the snow disappeared this past week. Harvested a few sprigs of the above thyme to add to the roasted root crop (oops, again no photo, can’t believe my first harvest of the year and I forgot to take photos). The scallions survived the winter. 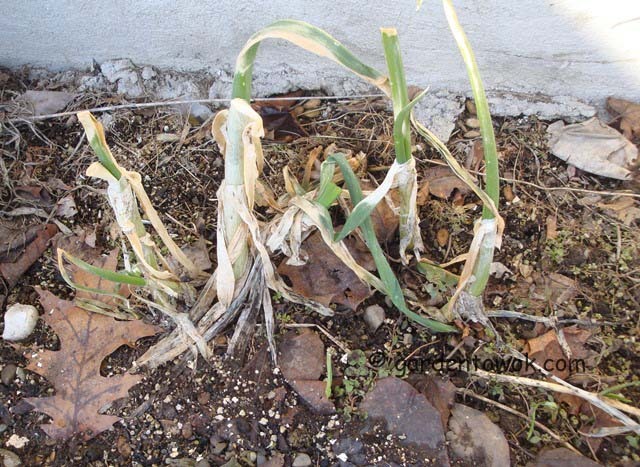 This week, weather permitting, I will clean up the area, carefully remove all the dead scallion parts and new plants should be coming up along the sides of each. The sage also survived the harsh winter. After tidying up the area I will prune the plant to keep it under control. The twig in front is the seed stalk of a cilantro plant that I never got around to take care of last fall. The seeds have fallen to the grounds. As soon as the soil warms up I should see many volunteer cilantro plants appearing. The benefit of a lazy and disorganized gardener. The celeriac seeds germinated, took 10 days. Did more indoor seeding: Radicchio/Chicory, Chard, Kohlrabi and Collard. This entry was posted in Cooking, Gardening, Harvest Monday, Herbs, Heritage vegetable garden, Locust Grove, Recipes and tagged overwintered root crop, sage, scallion, thyme. Bookmark the permalink. I am amazed what survived and continues to live in the icy cold winter you’ve just had. Are you expecting a cold Summer? The first day of Autumn was flippin freezing in my town, we went from air conditioner to heaters in a day. Brrr. Your veggies look great, especially the beet with legs. LOL! I was amazed when I saw the scallions, can’t wait to get out and tidying up the area to make a happy environment for them to thrive. Weather is crazy everywhere this year it seems. That is a lovely mix of vegetables you had in storage. My rosemary melted out and I had to bury it in snow again to try to help it survive. We have had such cold and windy days recently. It feels more like February than the end of March. I’m beginning to wonder when spring will actually come. I’ve been looking back at my first planting dates in the spring. This might beat them all. I can never get rosemary to overwinter. Yep, a harsh, long drawn out winter for sure, wondering what the growing season will be like this year. Hopefully we will have less bugs because of the extreme and prolonged cold. I was pleasantly surprised, am going to tidy up the area ASAP so they will have a happy environment. My rosemary and thyme also survived the winter…hooray! Rosemary will not survive our winter, need to bring it indoor or get new plant in spring. This is wonderful. I have a question though HOW ON EARTH DID YOUR THYME SURVIVED?!! We had some snow and freezing temperatures here in Colorado but my rosemary and mint did not survive 😦 they went all black overnight. Temperature dropped one night and sadly in the morning they were all black.. what do you think I should do? They are not dead I think they are just black as if they had frost bite!!! Thyme is very hardy so is mint, rosemary on the other hand will not survive our winter. I would cut away the black areas of the rosemary and mint and see is they will bounce back. I have yet to take the straw off of my green onions & kale – we shall see if I’m as lucky as you with overwintering & am able to get some early veg. We ALL deserve a great spring and summer after this dreadful (and LONG) winter! Yes, we all deserve a great spring and summer, hope they both arrive soon, it’s windy and winterlike today. Your method of preserving the veg is just like what used to be popular here a generation or two ago, except that they would have used wooden boxes filled with sand. I’m assuming that Sunchokes are like Jerusalem Artichokes? Yes, sunchoke is Jerusalem artichokes. I used to use sand but found it to be very messy. Did we have snow! Started around noon the first day of spring and into the evening, the snow plow came around 10 p.m. to plow my driveway. Will be awhile before all the snow melt away. Your root veggie preservation system is quite ingenious and effective. I have to keep my root veggies in the fridge, the garage may not be heated but it’s still too warm. You must have more than one fridge. I am hoping spring is just around the bend. It is so nice to see signs of life in your garden, Norma! I have to set foot in the main garden, wondering what awaits me????? The nerve of mother nature, to have snow on the first day of spring…??? 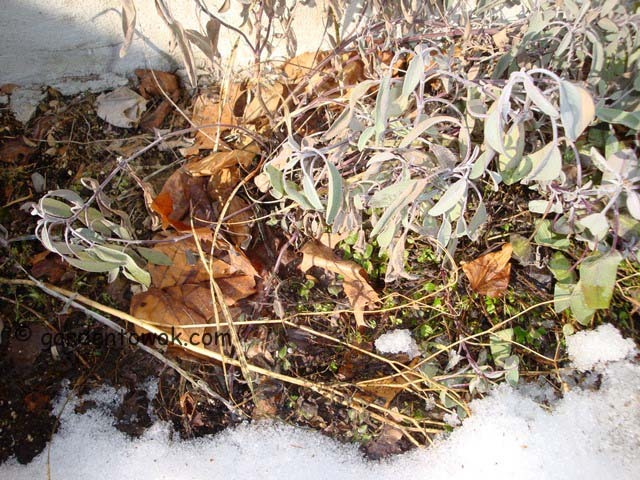 Glad to see that your Thyme and sage might have made it through the rough winter. I would love to have roasted your root veggies with a little bit of thyme and olive oil and garlic, of course, in the oven. Delicious. I hope you are doing well, take care! Is it mother nature or old man winter? I try not always successful but have fun nevertheless. Survival of the fittest! You had several crops that look like they’ll blossom as the snow continues to melt. Love those purple carrots! Those purple carrots were supposed to be longer, will see how this year’s transplant experiment goes. 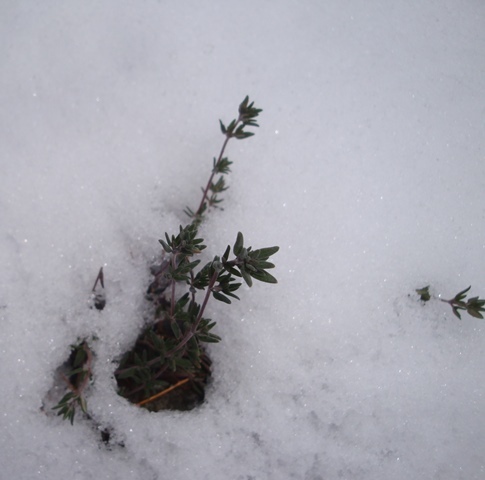 Amazing how the thyme is surviving the snow…great “collection” of roots. Thyme is one of the hardiest herbs. Looking forward to seeing your edible flowers in your photos. Have a lovly weekend. That is great to see that your thyme plant survived those terrible Winter conditions. We had a mild Winter & I have a walled garden so every plant survived! You had a lovely veggie produce ooh yes! Can you believe I woke up to light snow this morning (3/30/15)? Glad all your plants survived the winter, I am yet to enter my main veggie garden to see what if anything survived. My gosh, your overwintered herbs look so much better than mine…and mine didn’t have any snow to contend with! I see you did get more snow…am working my way forward and catching up. Glad it was a relatively small one this time. Spring is coming, a bit late but will be here soon.